When the name San Francisco is mentioned, most people think of the Golden Gate Bridge or perhaps the city’s famous cable cars. 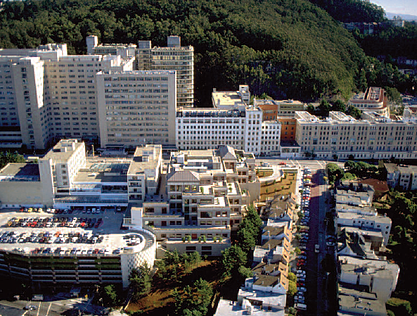 In the medical/educational community, the name San Francisco almost immediately brings to mind the University. Unique in its mission for focusing only on graduate school, hospitals and research, the University of California, San Francisco is recognized both nationally and internationally as a top tier institution. Its hospitals are ranked in the country’s top ten and it’s dental, nursing and pharmacy programs are some of the best in the nation. The University is spread over four separate campuses throughout the city, with a fifth under construction, and has a staff of almost 20,000 employees. Bob Norton, one of the school’s designated locksmiths, is responsible for keys to the school’s more than 30,000 doors. 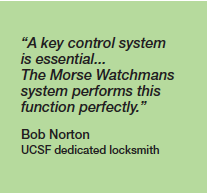 To help ensure the management and safekeeping of the keys, Mr. Norton relies on the Morse Watchmans KeyWatcher key control and management system. The KeyWatcher automated key control system is designed to release keys only to pre-authorized users and to record and track all access activity. The Morse Watchmans key control system has been in place at the University for almost ten years and has been upgraded as well as expanded to encompass more than 25 key control cabinets. During that time, the most significant change to the system was converting the key cabinet access from a keypad to the use of the University’s identification key cards. In addition, over a period of three years Mr. Norton’s department worked with the University’s IT department to network the cabinets and provide central control and transmission of all activity back to a dedicated central server. The changes to the system and to the policies and procedures were made to address the large number of employees who are issued keys and the subsequent potential for lost or duplicated keys. Changing the system to the requirement of using a UCSF identification card to access the key cabinet effectively eliminated these concerns. And because the key control cabinets are centrally managed, changes to authorization can be made remotely as needed to help ensure the integrity of the system. The scope of the project also called for the accounting and cataloging of all keys issued for all four campuses. With thousands of door keys to manage, Mr. Norton says it was more practical and realistic to store only the master keys in the KeyWatcher cabinets. Even with this concession, the number of keys to be stored and managed was still significant and required the use of specialized key rings. Reliability of the system has never posed a problem and maintenance on the system has been minimal according to Mr. Norton. He says that keys are accessed hundreds of times a day throughout the four campuses and the KeyWatcher system dutifully records and transmits each and every activity. It is so reliable in fact that management from the custodial and grounds crew staff has requested copies of activity reports for comparison to time and attendance reports submitted to them by their staff. The network capability permits Mr. Norton to receive transaction data as it occurs or on a regularly scheduled basis, including keys in use and overdue keys, inconsistent key usage and an audit trail for every user or key. For added user convenience, keys can be returned randomly to any open location in the cabinet. The illuminated key slots make accessing and returning keys easier and the system cannot be manipulated or easily tampered with. The University continues to be extremely satisfied to work with Morse Watchmans as their system grows and evolves. “Morse Watchmans was there to assist us and provide the engineering support we needed to modify the system in order to meet our needs,” said Mr. Norton.